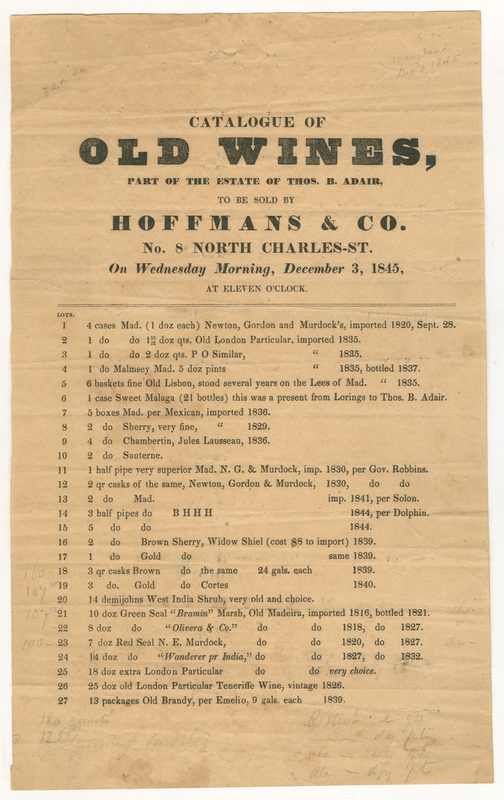 Home > History of Wine	> Three America Wine Auction Broadsides from the 1840s and 1850s. 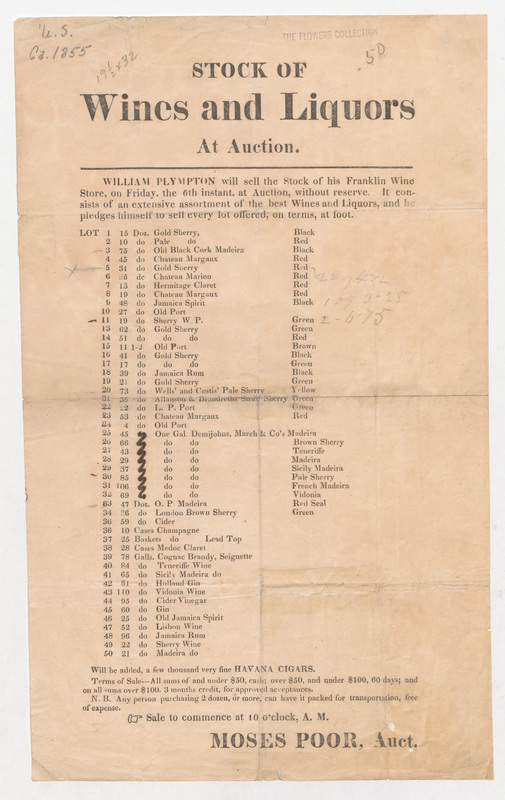 Three America Wine Auction Broadsides from the 1840s and 1850s. It was not until I began to correspond with Mannie Berk, proprietor of The Rare Wine Co., that I began to look at historic wine auction catalogs. Some of these catalogs are multi-page documents with a few hundred lots of wine. Others are simply single-sheet broadsides. In this post I present three publicly available broadsides from the 1840s and 1850s. I find these broadsides interesting because they allow us to trace the movement of specific parcels of wine such as the “Bramin”, “Wanderer”, “Hindostan”, “Mandarin”, and “Odessa” Madeiras. These last three names are new to me. 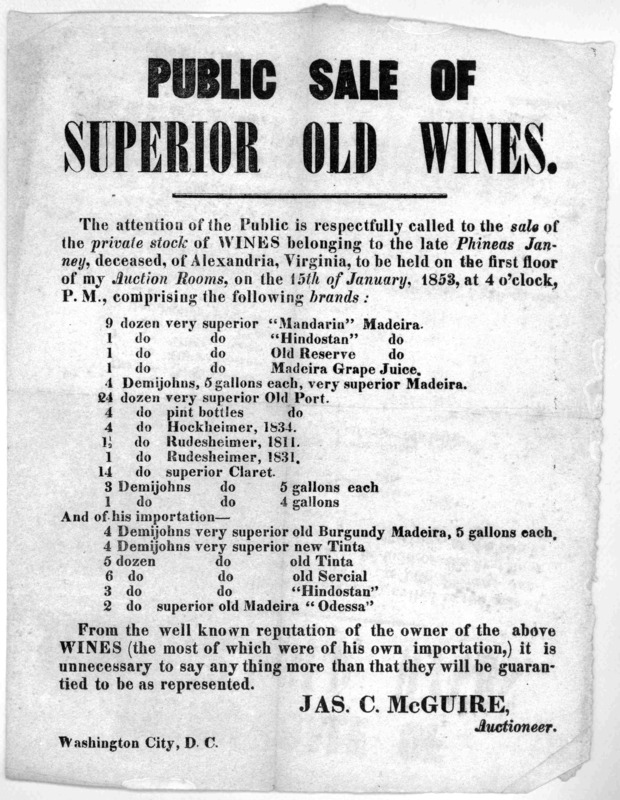 There are also unique wines such as the “Old Lisbon, stood several years on the Lees of Mad[eira].” or the specific parcels of 1836 Jules Lausseau, Chambertin. Perhaps illustrating the practice of blending Bordeaux is the lot of “Hermitage Claret” prior to the lot of Chateau Margaux. We can also learn about the types of wax seals used such as “Green Seal” and “Red Seal” Madeira. The sale of William Plympton’s wines suggest a wide range of wax colors. The right-most column could indicate the wax color because the lot of “Old Black Cork Madeira” is followed by color Black. In this case he used five different colors of wax: black, red, green, brown, and yellow.